Talking to those with more moderate stances is a good place to start. Learning from these conversations and building on them can lead to more successful outcomes in the future. Having a firm grasp on the science is useful, but above all else make it clear that there is a scientific consensus that climate change is man-made and a serious threat. Keep the message positive and focus on the benefits of taking action. Communication among peers and family is key to increasing engagement with the issue of climate change. However, conversation on the topic is less frequent than one might expect. 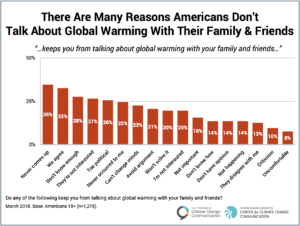 While approximately six in ten Americans say that global warming is personally important to them, only about a third say that they talk with friends and family about the issue at least occasionally. 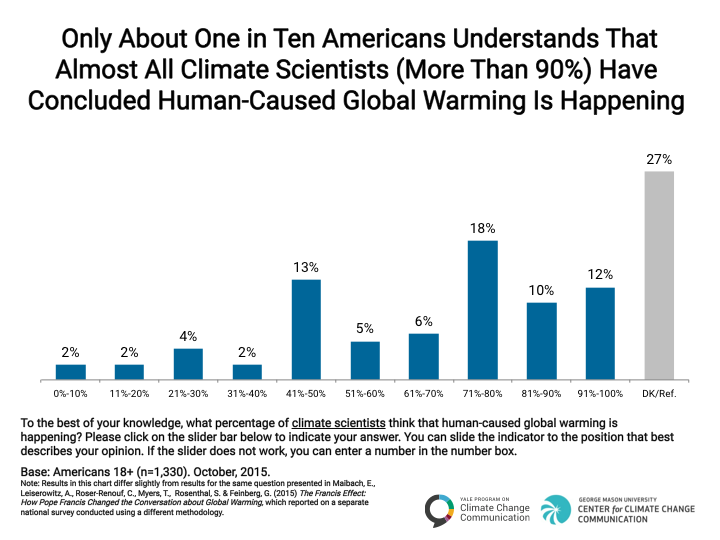 This points to a phenomenon first identified by YPCCC researchers known as the climate change “spiral of silence”– people concerned about the climate avoid voicing their worry because they rarely hear others discussing the topic, and thus the spiral continues. In order to break the cycle, concerned individuals must take it upon themselves to engage in productive dialogues with those around them. This may be an onerous task for some, but broaching the topic could have an unexpectedly powerful impact. 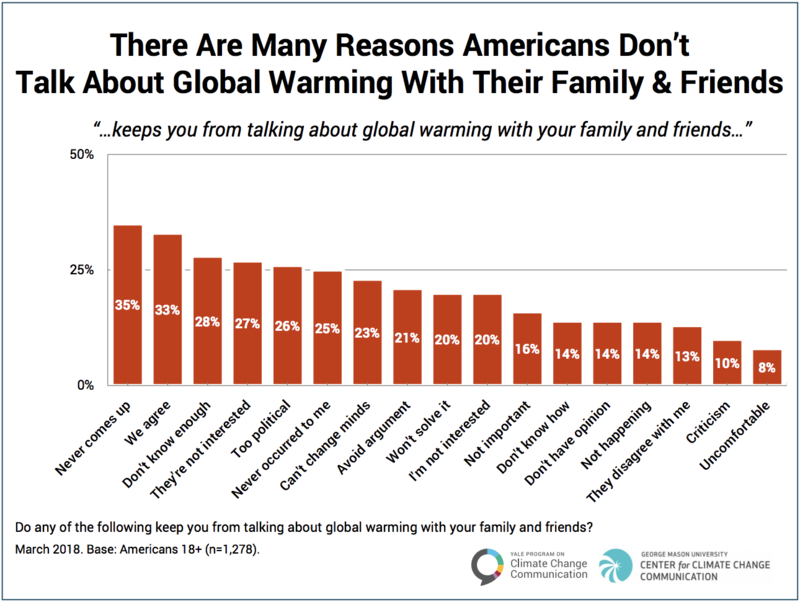 A 2013 YPCCC survey found that “Americans say their own family and friends have the greatest ability to convince them to take action on climate change.” So how should we approach these conversations? Before jumping right in and attempting to change the mind of someone you know is actively hostile to climate change policy, it’s wiser to begin by talking to those with more moderate opinions. While it may seem natural to target those who are the loudest, they are also less likely to come around to another point of view. On the other hand, speaking with those you believe are more willing to have a good-faith dialogue will lead to a better chance of success – however it is defined – and provide insight that can be used and built upon in future conversations with those who hold stronger opinions. Indeed, there is no shortage of people with moderate views on global warming. YPCCC has split Americans into six different climate-opinion categories, ranging from the Alarmed to the Dismissive. While the dismissive only make up about 10% of the country, most people tend to fall closer to the middle. That means there is a lot of common ground to be explored. Conversations about climate change in the mainstream media and online tend to represent the issue as politically charged and highly divisive, and as a result people may be quick to label someone with a different stance in a way that makes their views easier to dismiss. 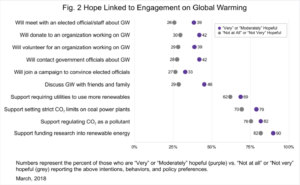 In other words, when someone has an opposing stance on climate change, people tend to correlate that belief with strong opposing opinions on related topics. But such assumptions are often wrong, and we often have more in common than we might first think. No matter one’s views on the climate, there are certain environmental values and beliefs that have near-universal appeal. Being good stewards of the Earth’s resources, keeping corporations from setting government policy at will, and the idea that humans generally have a negative impact on the planet are typical examples. Working forward from an established common ground allows one to tailor their messages more precisely. While only about four in ten Americans believe that global warming will personally do them at least a moderate amount of harm, it will very likely impact other things about which they are concerned. Figuring out what these concerns are is key to starting a meaningful exchange. Given the volume of misinformation, having a solid grasp on the science behind climate change is important to making persuasive arguments. When conversing with someone who is skeptical of the science, there are a number of oft repeated claims that tend to come up. Yale Climate Connections has produced a helpful series of articles that addresses each of these step by step. Yet at the same time, research has shown that when presented with facts that contradict strongly held beliefs, people will turn away from logical reasoning towards arguments that cannot be scientifically falsified. At this point, informal trials have shown that it is effective to engage on an emotional level by communicating personal hopes, fears, and experiences. Recent YPCCC research has shown that worry about climate change among Americans is on the rise while hope is decreasing. Both hope and worry can spur constructive engagement, but staying positive is important in the context of a personal conversation. 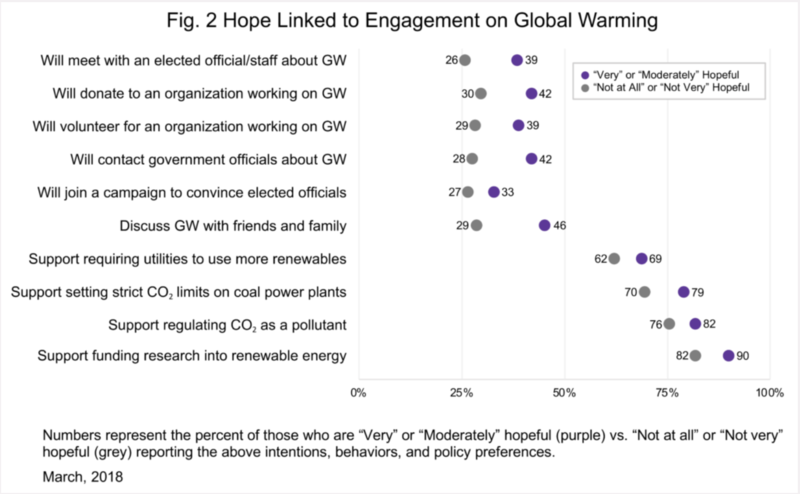 The same report found that hopeful individuals are not only more likely to support policies to mitigate global warming, but they are also more likely to speak to family and friends about it. So an optimistic conversation does not just create a temporary break in the spiral of silence – it builds momentum towards reversing it altogether. Despite a constant stream of alarming news, there are plenty of positives to focus on. Renewable energy is advancing rapidly, cities and states are setting ambitious targets, and individuals across the world are showing up to press for action. Acknowledgement of the seriousness of climate change is essential, but complementing that message with faith in our ability to tackle it – if we undertake a rapid and sweeping transformation – can help motivate others to act. Most Americans have little confidence in their personal ability to influence policy, but productive conversations are the first step to overcoming these feelings and moving towards action.